Based on the fictitious company “Your Company“, we show you how you can present your products with DesignFiX. Your company logo will appear on the start page and in all categories at top right. Your anchors are hierarchically displayed on the left side in a product tree structure. Once we have implemented your products in DesignFiX, you can offer your customers DesignFiX on your website free of charge as a download version. Your customer installs your DesignFiX version and can immediately afterwards perform an anchor design with your products. 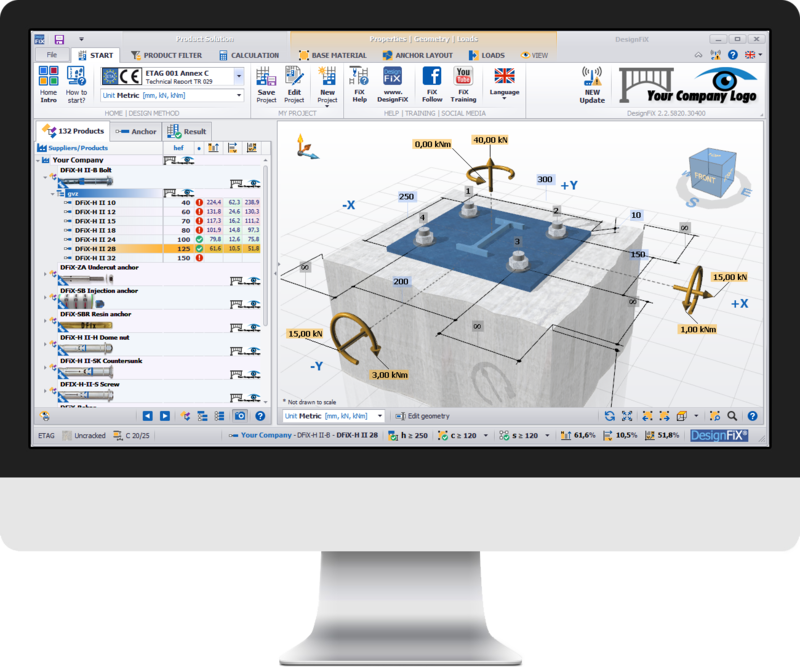 Make it easy for your customers to work with your products by using a proven design program with an intuitive user interface. DesignFiX is intuitive and easy to use. 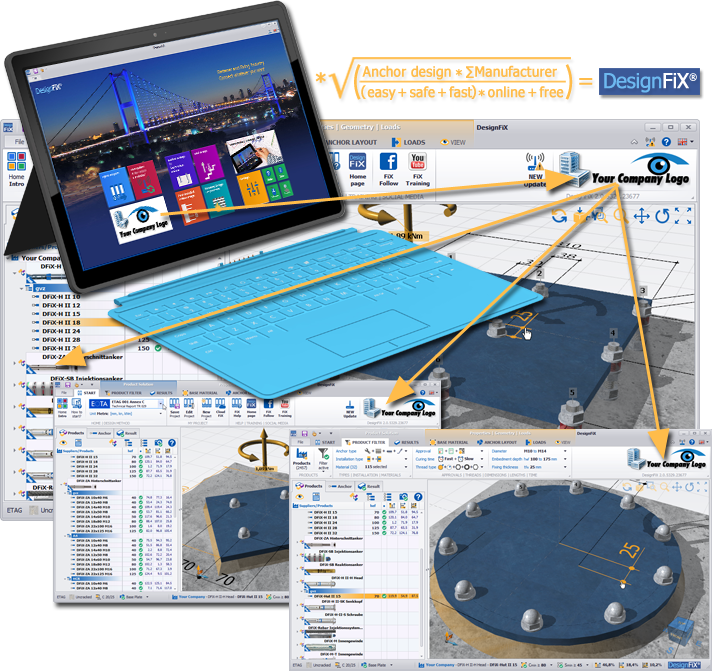 Simple and intuitive to use design software for professionals by professionals for planning and calculation of fixings with anchors of different manufacturers. 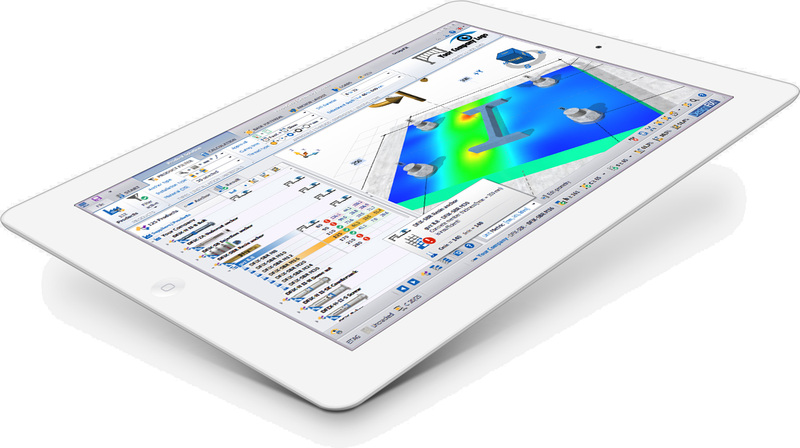 The software considers important design standards and regulations and, therefore, can be used in many countries worldwide. All loads and dimensions can be displayed and handled in metric and imperial units. The easy and quick input of most values directly into the user interface simplifies the design. The status bar shows in real time the utilization of the fastening for the different load directions. Clear labels and large icons will help you to use the program, particularly on computers with touchscreen. Highest flexibility in choosing the products is guaranteed by a tree structure with many filter options and product information are permanently available. DesignFiX recognizes incorrect inputs with respect to geometrical conditions and provides adequate suggestions for improvement. Thereby, the working time is reduced to a minimum. The verifiable printout gives you the opportunity to trace each calculation step of the program. This gives you the confidence that your design results are complete and understandable. What is Included in DesignFiX? Setup to install DesignFiX with your range of products on Microsoft Windows®-based operating systems. Compatible with Windows Vista®, Windows 7®, Windows 8® and Windows 10®. Implementation of your product range for the design methods: ETAG 001 Annex C, ETAG 001 TR 029. FEM-module for calculation of the base plate thickness (Finite Elements). Seismic module for design under earthquake loads according to ETAG 001, TR 045. Your logo branding into DesignFiX (Intro page, User interface, Homepage). Printout of the results using company branding. Neutral download form for embedding into your homepage. Download form -> automatic e-mail delivery with installation instructions. Access to statistics server for evaluation of the requested downloads. Training videos for demonstration of key program processes. DesignFiX-LiveUpdate for your company and all your customers. DesignFiX offers the perfect solution for the professional design of various fixing systems. DesignFiX supports your customers (planners, structural engineers and craftsmen) in the safe and reliable design of their projects. DesignFiX is modular and can be used for numerous applications. With the help of the user-friendly program fastenings can be designed easily and flexibly. By taking into account the relevant international standards, this software meets all requirements for global use. Never before, design of fixings was so easy! All modules can be combined in DesignFiX. DesignFiX knows your approvals and offers depending on the selected product (mechanical or chemical anchors) the right options for the anchor design. Send us your company logo and you will get a demo version. We create your professional corporate identity design for DesignFiX. The versions Studio, Business and Universal are available within 4 weeks after receiving your order. Highest flexibility in selecting the products is guaranteed by a tree structure with many filter options and product information are permanently available. With the help of automatic or manual LiveUpdate, DesignFiX is always up to date.